No not my birthday,that was a few years ago! 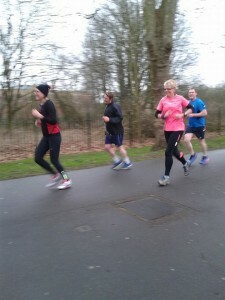 February 14th was not only Valentines day but the day I ran my 50th Parkrun. Encouraged along by Geoff, I finally gave in and went along to see what all the fuss was about on 11th May 2013, I enjoyed the friendly atmosphere as much as I did the run but it was well over a month before I did another one. Then I was hooked and I cannot imagine a weekend without a parkrun, when Geoff is away parkrun is what makes my weekends bearable! Its not really about the running its more about the friendly people and how they become like a family to you. 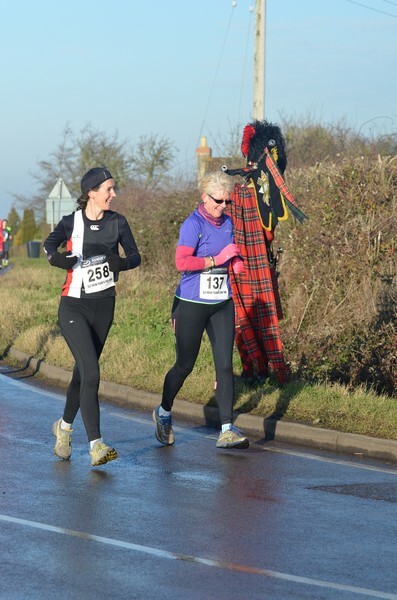 If we are visiting friends on a Saturday the first thing I do is look to see where the nearest parkrun is and I even got up early on Christmas day to go along to the Ferry Meadows Christmas day run and its been lovely to have Geoff encourage and support me. 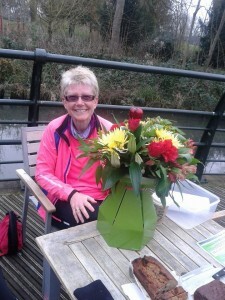 I was disappointed that Geoff was going to be away for my 50th run but I made cake for all my running friends and I knew we would have a fun time, the biggest surprise of all was getting beautiful flowers delivered to me at parkrun from Geoff, letting me know he was thinking about me. 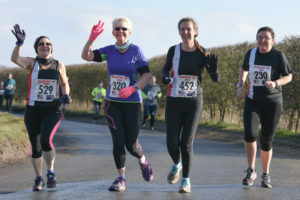 I have done 36 parkrun’s at King Lynn, 10 at Milton, Cambridge, 1 at Colwick, 1 at Peterborough, 1 at Hanley, Staffs and 1 at Clumber Park, no matter where you go there is always a warm and welcoming atmosphere BUT nothing is quite as special as doing a home parkrun. 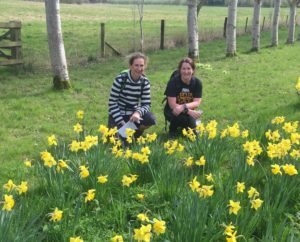 This entry was posted in Parkrun, Running on February 27, 2015 by Sally. Once I was able too, around the beginning of December,I started back at parkrun taking it nice and easy, my achilles still ached but I could manage the 5km. Christmas Day I was up nice and early to go to Ferry Meadows Christmas day parkrun, over 300 other runners turned up too, a great way to start Christmas day and a really nice running route,lovely that Geoff came along to support and take photos too. I decided not to run again then till New years Eve to give my achilles time to rest. Although Gina is a much faster runner than me she decided she wanted to run with me to make sure I was ok and much to my delight after not running that distance since September I managed it in just over an hour. This entry was posted in 10km, Parkrun, Personal on February 5, 2015 by Sally. 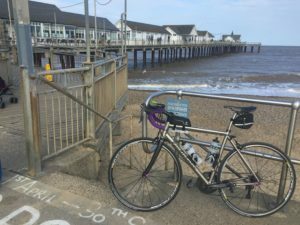 As my birthday fell on a weekend it was easy to decide what I wanted to do, Kings Lynn Parkrun and SWNC club ride, two things that have become very important to me. 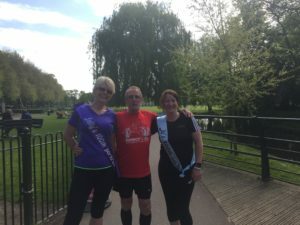 My lovely friends Gina and Jayne were going to come over from Norwich and join me for parkrun and lunch and with Geoff having returned from his travels it was going to be a lovely day but even I never expected the surprise Geoff had in store for me. Geoff gave me an unexpected parcel which when opened was a Belkin WeMo Switch, now as we are into gadgets I thought great something else to play with !! 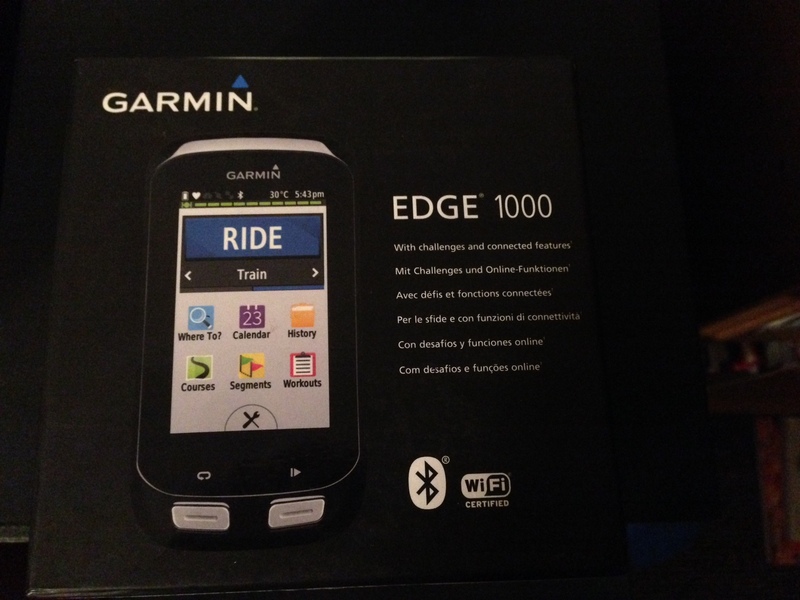 Which was a Garmin Edge 1000 !!!!!!!! When Gina and Jayne arrived at 8am I was in a dizzy excited mood to say the least but we managed to get ourselves and the cakes I had baked to parkrun on time. 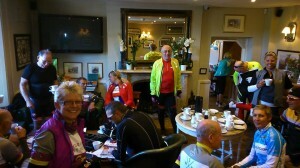 Where we enjoyed a lovely chatty run and much to my delight everyone enjoyed the carrot cake I had made. 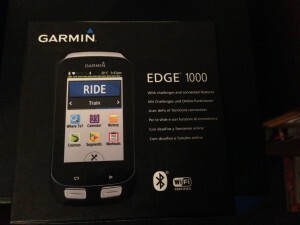 Gina and Jayne left around 5pm and I spent the evening playing with my Garmin and setting it up ready for Sunday’s club ride. Earlier on in the week SWNC had asked me where I wanted to ride too, I knew straight away that I wanted to go to the Bedlingfeld Arms, a club ride I had always missed before. We had a fantastic ride out to the Bedlingfeld arms in brilliant Autumn sunshine, the landlady laid on lovely tea/coffee and cake for us and my Garmin worked so well I was shouting out the directions at most junctions, when not too busy chatting ! 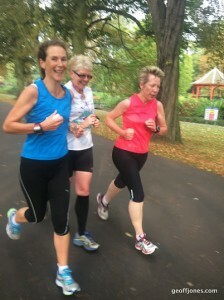 This entry was posted in Biking, Parkrun, Personal, Running, SWNC on October 8, 2014 by Sally. Geoff and I then went off to have a fabulous 3 nights at The Ship in Dunwich, a truly excellent place to stay if you enjoy the coast in winter. We managed 2 great walks avoiding all rain,although plenty of the footpaths were flooded and foot bridges had been washed away in places !! We arrived back in Cambridge today after stopping at the Emmerdale Farm shop, in Suffolk, where we managed to buy everything needed for our Christmas day feast, no queues no hassle no fuss !! I then had time to pop into Advance Performance for a new pair of running shoes, where I am always impressed with the advice and knowledge they offer. It was nice and quiet in the shop today so they had plenty time just for me…… it seems my lower back/hip ache is caused because I swing my hips when I run instead of lifting my knees !! Apart from the fact that my shoes were totally knackered they had been a very good fit. So after trying on a few shoes, including a lovely pair of ladies, purple Mizuno, Â which just didn’t feel quite right I opted for yet another pair of men’s Saucony, in a boring blue !! 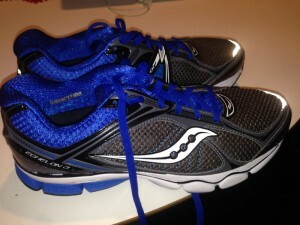 I was also advised to change my running shoes after 500 miles or a year depending on what comes first.. This entry was posted in Parkrun, Running on December 24, 2013 by Sally. Before Geoff Â goes off on his travels again IÂ am so looking forward to spending some time with him over Christmas and the new Year. We are booked to go and stay at The ship in Dunwich for a few days right before Christmas, its very exciting as I love being near the sea in winter time and have always wanted to stay here. Although it did mean I was going to miss the ChristmasÂ King’s Lynn Parkrun Fancy Dress . 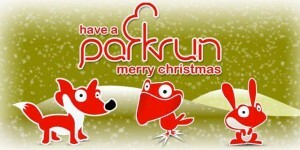 Not that I am becoming Fanatical about parkrun !! 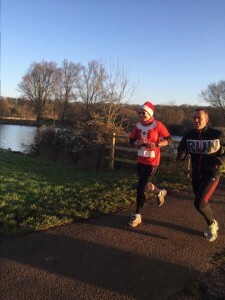 This entry was posted in Parkrun, Running on December 12, 2013 by Sally. Last Saturday 14th September was Kings Lynn’s parkrun’s second birthday. Doing the parkrun is something new for me but it can become highly addictive as its so much fun and very sociable. 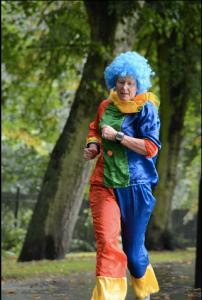 I never usually dress up but decided to join in the fun and ran dressed as a clown, complete with wig, which gave many people a smile on a dull and rainy day. 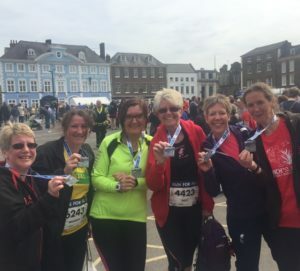 This entry was posted in Kings Lynn, Parkrun, Running on September 20, 2013 by Sally.